I have always loved to climb trees; still do, although opportunities are less frequent. The avocado tree in my memory was huge with several low horizontal limbs; when ensconced within its dense, overhanging foliage, I was invisible. What really mystifies me: How can I have grown up surrounded by this most delicious fruit without EATING it? 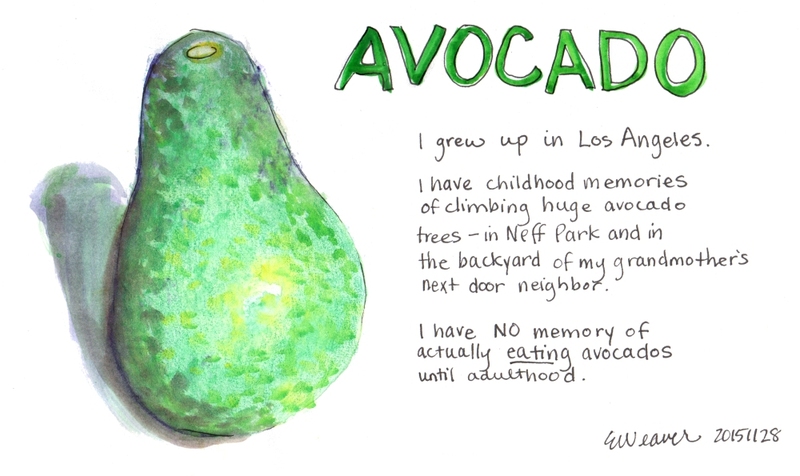 I suspect it might have something to do with the fact that my parents and grandparents all grew up in colder climes where avocados did not grow…but they’d all lived in Southern California for quite awhile by then and had certainly adopted other local customs. Today I wonder: what amazing abundance surrounds me NOW that I am unable to see? I used to visit LA every Christmas, mostly for work. I had a friend who had an avocado tree in her back yard. I used to bring them home with me. They were far better than any I could ever get in the store. I really enjoyed your post and your avocado, too.